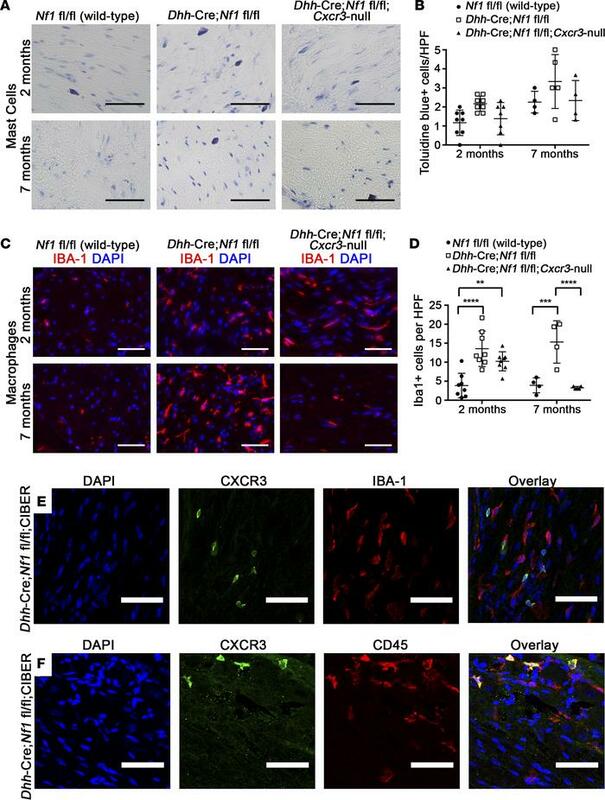 The effects of Cxcr3 deletion on mast cell and macrophage infiltration of Dhh-Cre Nf1fl/fl nerves (n ≥ 4 all groups). (A) Toluidine blue staining in 2-month and 7-month sciatic nerves (original magnification, ×40. Scale bar: 50 μm). (B) Mast cell infiltration of nerves was not significantly affected by loss of Cxcr3 (NS, 2-way ANOVA). HPF, high-power field. (C) Iba-1 (macrophage) staining in sciatic nerves (original magnification, ×40. Scale bar: 50 μm). (D) Loss of Cxcr3 did not affect the initial recruitment of macrophages to nerves but resulted in the resolution of macrophage inflammation by 7 months (**P < 0.01, ***P < 0.001, ****P < 0.0001, 2-way ANOVA with Tukey’s MCT). Symbols represent individual mice; horizontal bars indicate the mean ± SD. (E) Cxcr3 expression does not colocalize to IBA-1+ macrophages (original magnification, ×20. Scale bar: 50 μm), but (F) Cxcr3-expressing cells are CD45+ hematopoietic cells (original magnification, ×20. Scale bar: 50 μm).